Bisti National Wilderness Area located in the Northwest corner of New Mexico is one of the least visited national lands in the country. Over 1,000 years ago it was one of the major population sites for Navajo (Diné) people. Bisti is an area filled with some of the most unique and unusual wind and weather sculpted rock formations in the world. 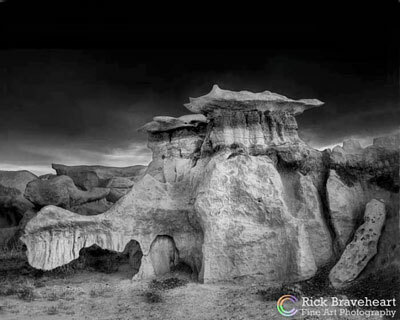 To recognize the history of this area and its ancient people it was photographed in black and white using an all-wooden "Seneca" medium format film camera manufactured in 1907.